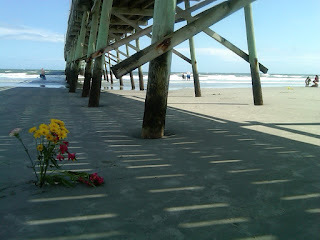 Kristiana and I did a whole lot of walking on Sunset Beach two weeks ago. And I took a whole lot of photos on our walks and sits and various visits to the beach. As I went through the photos, I noticed a variety of levels and kinds of strength in the photos. There were the manmade structures, like the cabana above. Staked into the ground at all four corners with thin cables and spikes, it was rather vulnerable to wind and water. One night, we watched as a similar cabana dealt with the incoming tide. Abandoned by its owners or renters, the cabana covered several chairs, folded umbrellas, body boards and other paraphrenalia. Along with some strangers passing by, I moved all the things under the cabana farther up onto the beach so that they wouldn't get pulled out into the water as the tide rolled in. We left the beach as the water was lapping against all four stakes. I wanted to stick around and see how long the stakes would hold. The cabana was gone in the morning. I am that cabana many days. Covering a multitude of other people's stuff, needs, and demands. Often forgotten, abandoned, and left to hold my own when life's waters, be they still or rough, lap around my feet and around my soul. Often I need help, sometimes from complete strangers, in keeping my stuff, my heart, and my soul safe from harm. We had made the long trek to this same spot four years ago and discovered that gaining access to the mailbox was not easy as the dunes were high and slippery. Many hurricanes and high tides later, the mailbox is within easy reach, still standing, but much closer to the shore than it was back then. I wonder if it is the strength of all those kindred spirits that keeps that mailbox and flagpole standing. Many high tides of fear, many hurricanes of loneliness later, I'm still standing. Sometimes I say things like, "I have no idea how I'm still standing or why." But I know that it is only by God's grace, the love of friends, and a steadfast refusal to loosen my grip on hope that I'm still here. The strength of sand is baffling to me. Its properties are equally confounding. It can hold a castle in place, but blow into my eyes with little provocation. It packs together when damp, but moves loosely when dry. It brings me joy when trampled underfoot in the sunshine, but makes me groan when crunched between my teeth. It is washed out to see during violent storms, but nearly impossible to remove from the scalp between my dreadlocs. Do you see the rabbit? What strength it displayed when sitting still while we took photos, and what speed it displayed when we moved closer to get a clearer shot. I was most impressed by the strength of the plant life at Sunset Beach. The most carefully tended garden patches and the finest grasses, the most delicate blossoms and the thickest bushes - they send their roots deep, their leaves high, and their faces to the sky. The sand blew. The waves crashed. And there they stood. They waved. They wavered. But they didn't move. When I grow up, I want to have roots as deep and shoots as strong as those plants. What was the story behind the placement of these flowers under the Sunset Beach pier? Were they meant to honor a life lost or a new life begun? Such fragile strength, such strong beauty. The longest list of questions was written in the notebook of my soul when we came upon this jetty at the end of the beach. Where on earth did those rocks come from? What massive implements had been used to transport them to this place? Did anyone get hurt while working on it? Who created this pile of stones? What did it mean to him or her or them? What would such an altar signify in my own life? What would it take to move these stones again? Where on earth does your strength come from? What did it take to get you to where you are now? Who helped you carry the stones in your life? Has anyone gotten hurt in the building of your life? Where have you built an altar of gratitude and praise for the victories? What would it take for you to give thanks to those who helped bring you thus far on your journey, to honor those who have walked with you and carried your burdens along with you? Having survived all that you have survived in your life, what would it take to move you from your current place of thankfulness, peace, joy, and strength? And don't shake your head and say foolish things like, "I'm not strong. I can barely make it through each day." Look around you. You are still here. You are still studying, girl. You are still working, my friend. You are still mothering and fathering. You are still being a loyal daughter and son, sister and brother, niece and nephew. You are still on this journey of life and love, and you are not alone. You are strong. You are wise. You are growing. You are being transformed from glory to glory. Feathers stuck in the sand. Strength. Simplicity. Beauty. Stillness. Presence. A fragile reminder of a fleeting life, a life in motion. I am reminded of Psalm 91. God's faithfulness will be your shield and rampart. but who also covers me with feathers and offers me rest in his shadow? A strong God. A tender God. A protective God. A caring God.